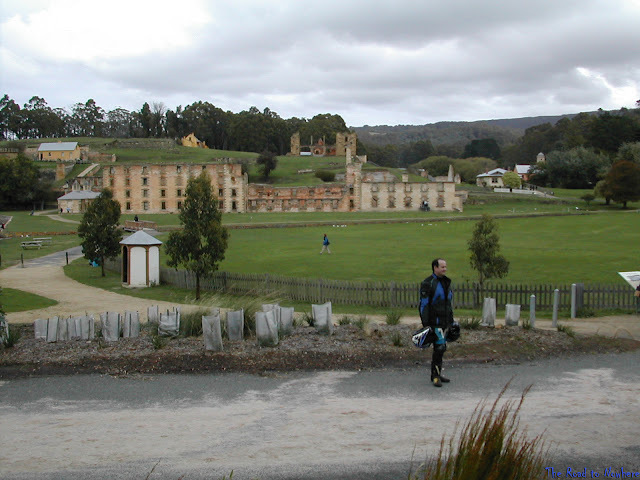 We left our accommodation at Eagle Hawk Neck and went down to a small place called Port Arthur. 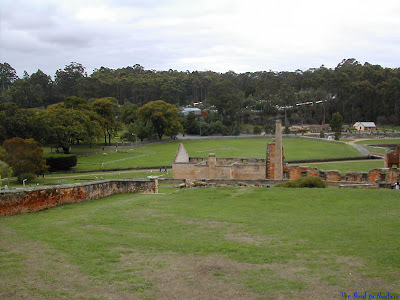 To those non Australian readers, Port Arthur was one of Australia's toughest prisons back in the convict days from 1833, up until its last prisoner was shipped out in 1877. There are still many of the prison buildings including the asylum and some of the original Chapel's built at the time still standing. You can still walk through all of these old buildings and look at the cells. It would have been hell to be locked up here. 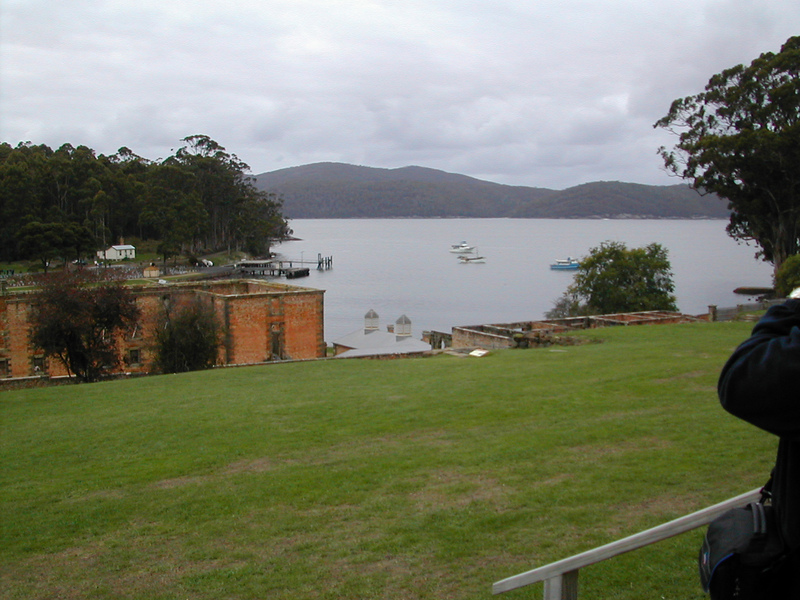 These days Port Arthur is a must see tourist attraction and I'd highly recommend it to anyone in the area to visit and see the rich history of this place. Above is looking across the field at the old prison complex. The prison used to house the most hardened criminals that were shipped out from England. 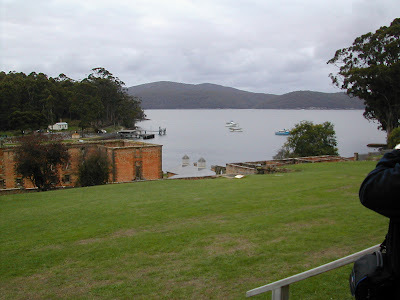 There were only 2 ways into Port Arthur which was by boat or the 30m wide peninsula at Eagle Hawk Neck connecting the mainland which was fenced and guarded by soldiers, man traps and half-starved dogs. 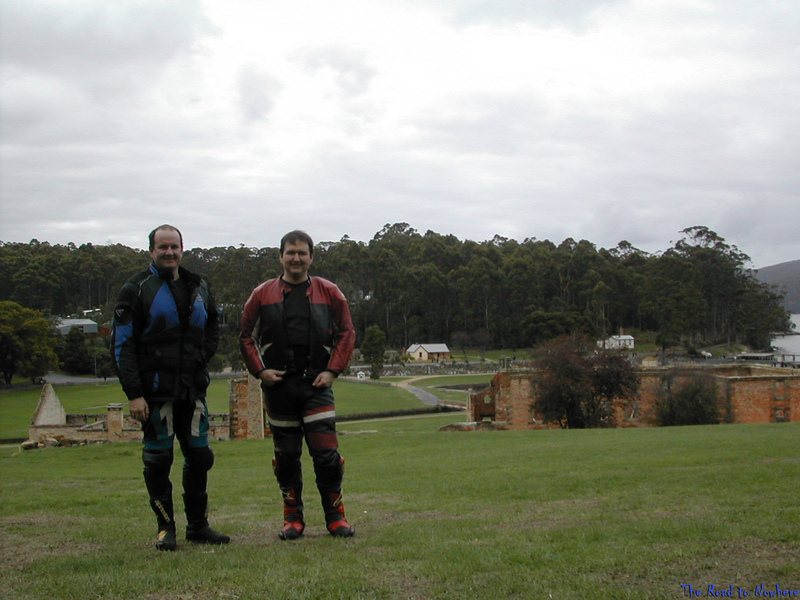 Back then most of the convicts couldn't swim either making this really hard to escape from, a real hell hole. 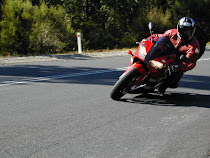 It wasn't exactly easy or pleasant walking around most of the day in full motorcycle leathers and gear, carrying helmets etc not to mention getting a few queer looks from other tourists, but it was all good and I was very happy to have that comfortable R1 seat to rest on for the trip into Hobart. Unfortunately Port Arthur was also the scene of one of the worst mass murders of our time known as the Port Arthur Massacre. On Sunday 28th April 1996 a lone gunman Martin Bryant walked into the Broad Arrow Cafe, and opened fire killing 20 and wounding 12 others within. He went outside shooting at others in the area before holing up in a nearby house where the police finally captured him. The final toll of that fateful day was 35 dead and 21 wounded. The Broad Arrow cafe has since been pulled down and is now just an outer shell with a reflection pool at the back and lush gardens surrounding it. I did not know how I would feel visiting this place after what had happened 7 years earlier. It was very quiet and somber. There were several other people here to. Nobody said a word. You could hear the birds in the tree's and the the wind blowing it was that quiet. 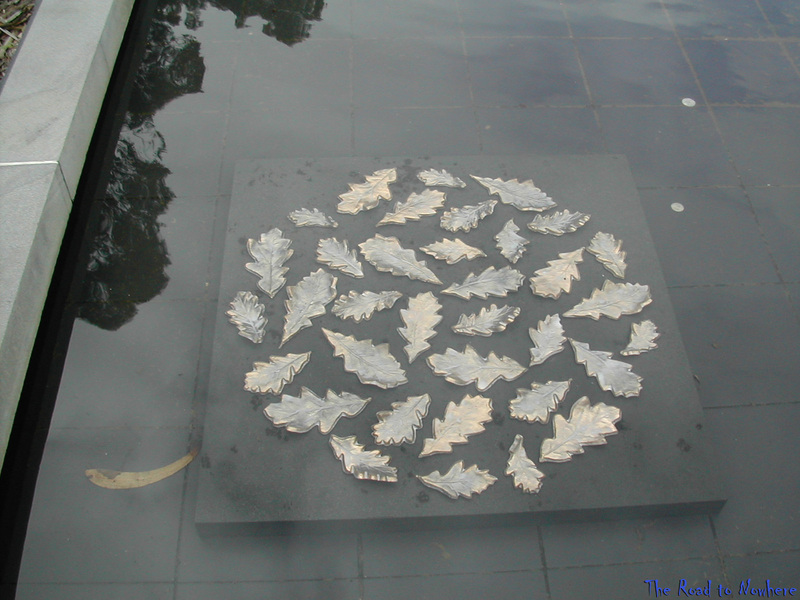 Looking into the reflection pool and seeing the wreath for the victims was a very sad moment. Even 2 years ago when I was here again with the family I'd felt exactly the same. From Port Arthur we headed into Hobart the capital city of Tasmania for our accommodation for the night and to look around at the city's sights. 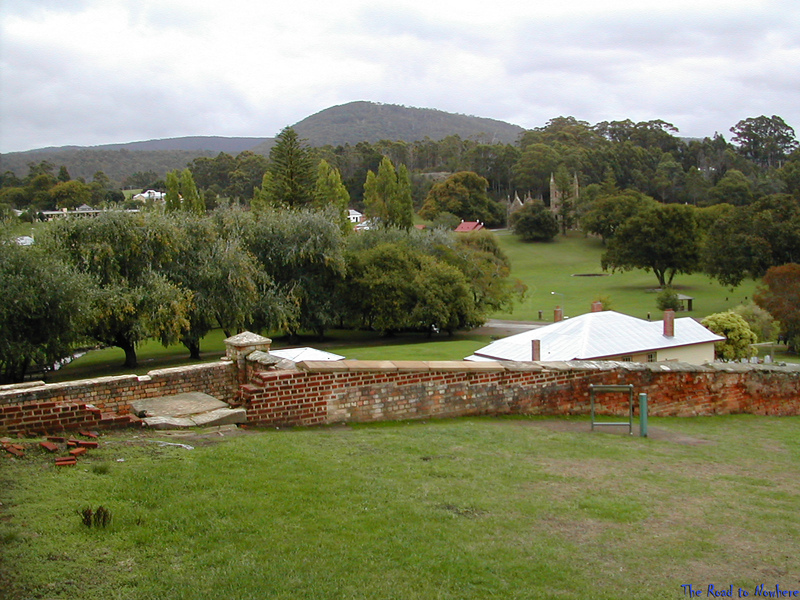 Hobart is a very picturesque place and is the second oldest city in Australia. Hobart sits on the mouth of the Derwent River which see's the finish of the Sydney to Hobart Yacht race every year which starts on boxing day. Hobart is also over shadowed by Mt Wellington that towers over the city and is visible for miles around. 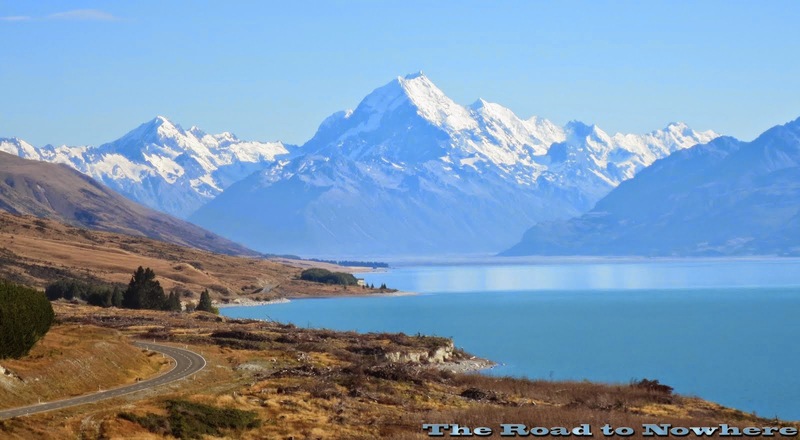 It is 1,271 metres (4,170 ft) high and it can even snow up here in summer. We spent most of the next day riding around the City and outer suburbs of Hobart. We took a ride up to Mount Wellington which over looks the city of Hobart. 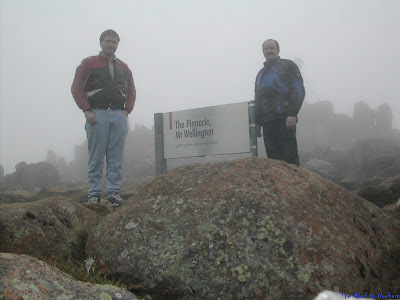 As we got to the top we found that it was covered in cloud and you couldn't see very far at all. So to get a good photo we had to come back down. We came back up here the next day but forgot to bring the camera. The views were a lot clearer then. D'oh. 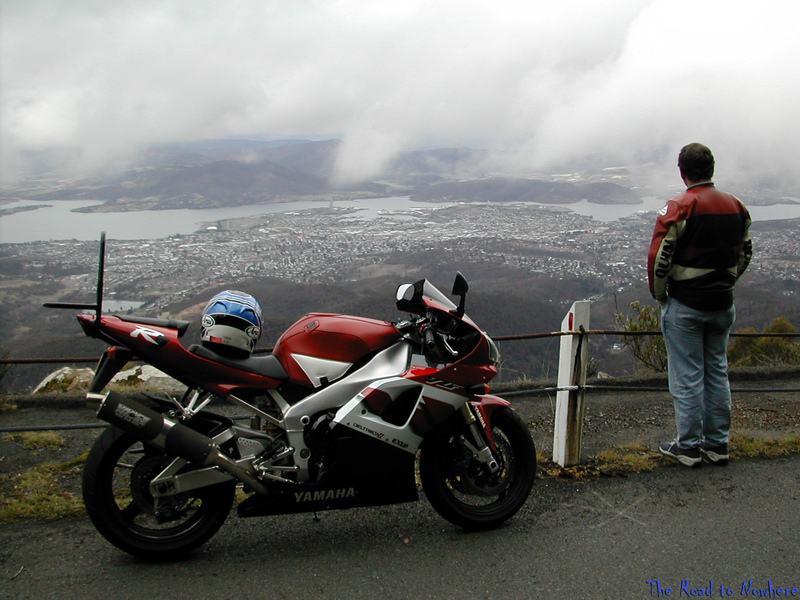 The above photo is also one of my all time favourite pics of me, my bike and Hobart in the background. I didn't even know Flyboy was taking one but I am glad he did. Thanks Bro and no still no royalty cheques. 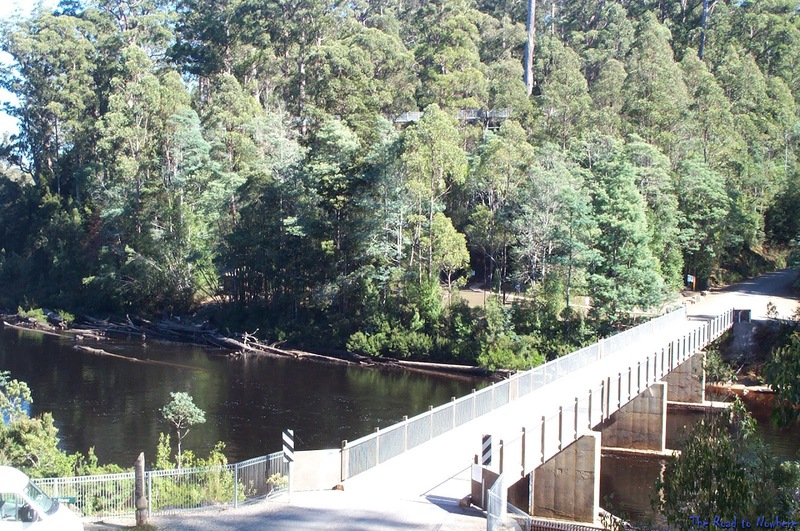 We also took a ride out Huon Hwy to Geeverston. From here we rode down to the Tahune Air walk which is a tree top walk about 30m above the ground that runs through the forest. 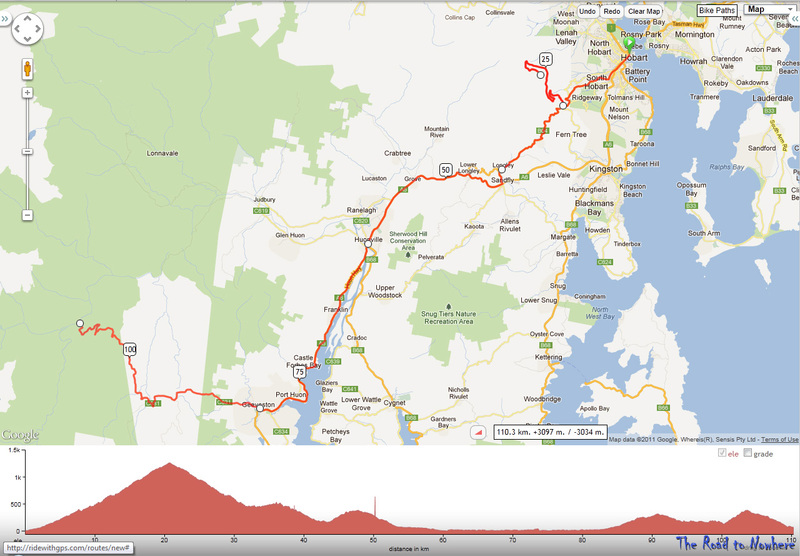 The road down to here was pretty good winding almost all of the 30km's. Best of all it was a dead end road so we had to come back the same way. 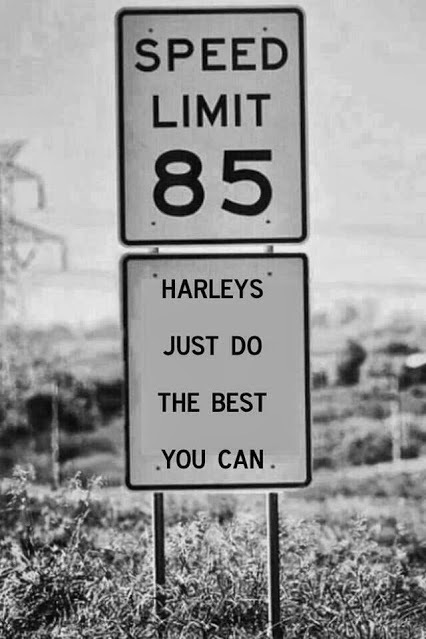 60km's of motorcycle bliss. 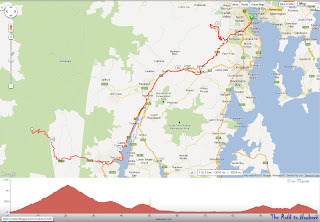 All in all another couple of excellent days riding and sight seeing that finished up back in the pub to try out some of tasmania's finest beers. 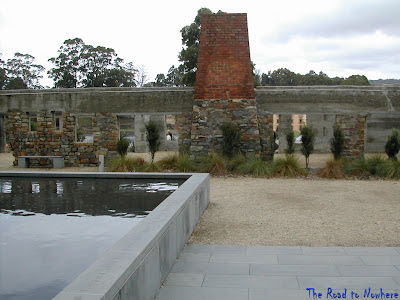 It was interesting to note that on the north side of the Island all you could buy was Boags beer which was made at the Boags brewery in Launceston. And as you travelled further south to the bottom end of the island all you could get was Cascade Beer made at the Cascade brewery in Hobart. 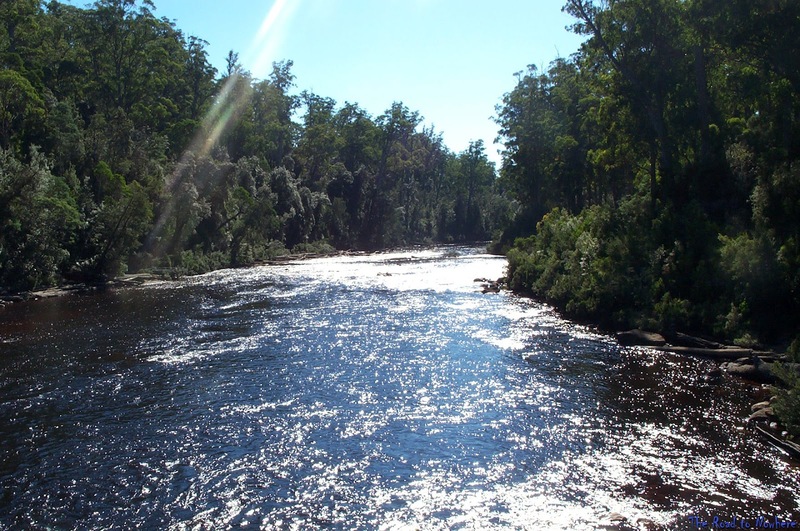 Tasmanians are very loyal to the beers they drink depending on where they live. I think Tassie is going to have to be a "must" for us Steve - wonderful shots. I remember the tragedy. We had a similar one at Aramoana and it's still almost as if there's a presence there that you can feel. For sure Geoff, you would love the place. It has a bit of that old world charm that is so often lost in this modern age. I looked up Aramoana on wiki and after reading about it I remember seeing something about it on the news, I would have only been 18 or so then and you are dead right in what you say, it is just like you can feel a presence about. So sad when these things happen, they should have taken up motorcycling instead, I bet it would have never happened if they did. 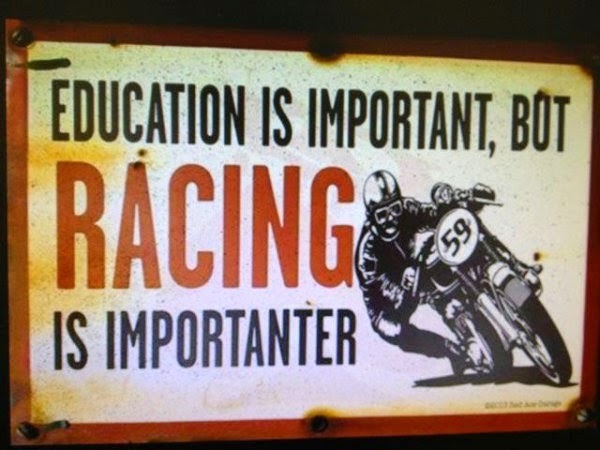 Motocyclists I know are generally a happy lot. 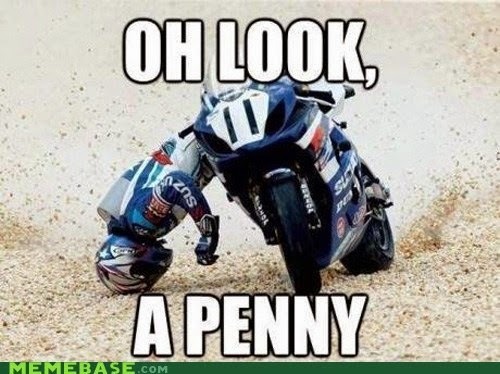 Watch out Geoff. 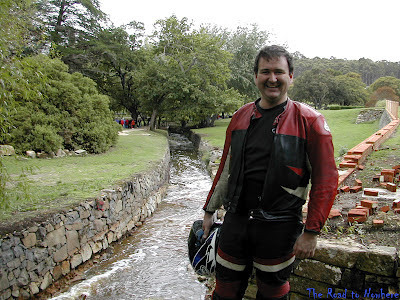 I think he is on Tourism Tasmania's payroll! I remember that day on Mt Wellington was freezing in jeans and a t-shirt. 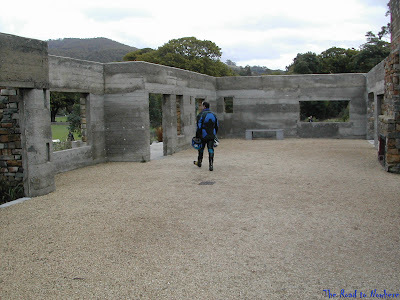 Port Arthur is a must do, including the boat ride, if you are in Tassie. 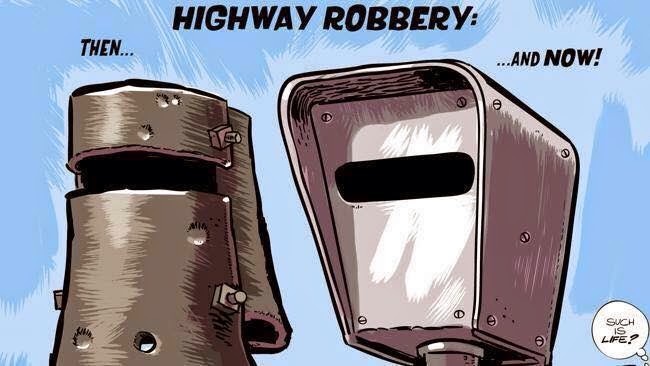 HA maybe they should be sending me royalty checks as well as New Zealand Tourism. If I remember rightly the boat ride is included in the entry fee so you may as well make the most out of it. Dark visors, thick fog, misted up visor on both sides brrrrr.... just thinking about it! 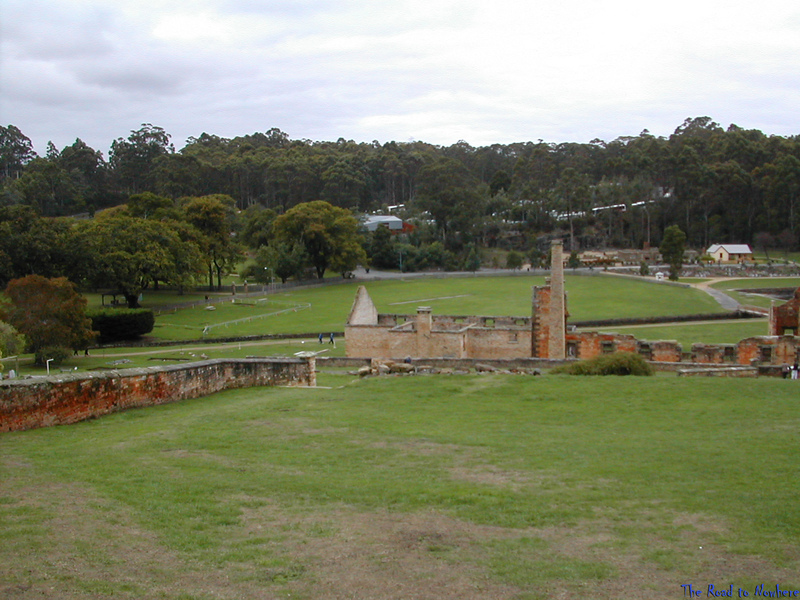 Port Arthur sounds like it is rooted in such deep history. It just makes you wonder about all the lost souls hanging around in the mist. 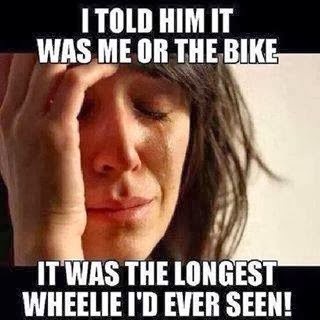 I remember freaking hubby out driving at night when a light snow was swirling around the road and we were driving through really light patches of fog. I told him we were driving through souls. That'll get you thinking when you are in the middle of nowhere in the wee hours of the morning. I think I freaked myself out too. Great pic of you looking over Hobart. I can see why Flyboy needs some royalties. Interesting though about the mist being lost souls. I'm enjoying the write up every bit as much as the pics. Our experience was that the locals are very positive about motorcycle tourists - very welcoming. 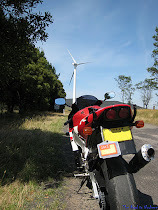 Thanks Jules - the tassvegians from memory were very motorcycle friendly. Offering to put our bikes in their lock up garages etc when we stayed at certain places. Some more great photos there!! I loved port arthur it's a great place to visit, but you are right about that feeling you get there. Did you go through the house, I think it was the commander's house or something, cant quite remember, but it was amazing to see that next to the prison. All the rest of the stuff I have never done .. stop now, you're giving me itchy feet!! Yes we pretty much went and did everything we could whilst at port arthur, including the boat ride out to the isle of the dead.